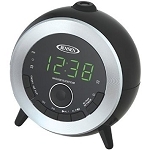 This quality product has the appearance of a typical alarm clock, but beneath the surface it implements a surprising variety of desirable features. For one thing, the owner never has to set the time and date. The clock does this automatically, and it has a battery backup. Rolling over and groping for the clock to check the time is frustrating, uncomfortable, and with the Jensen Projection Radio, unnecessary. In addition to its LED display, this clock projects the time on the wall or the ceiling. It also has sleep and snooze alarms and the option of waking to the radio or to an alarm. 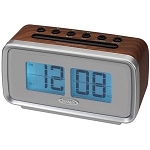 The highest degree of technological sophistication is found in the Dok Alarm with a charging station to keep your cell phone, tablet and mp3 player fully charged. In addition to a radio alarm, the Dok can play tracks from an external mp3 player. Having an alarm clock is a necessity today and always. Having a technologically sophisticated one with a long list of features including multiple radio alarms and simple controls makes getting up in the morning a little less unpleasant. To order a clock that fits your lifestyle, just click on the product and proceed to our easy-to-use shopping cart.